Did you get an heirloom diamond ring that just doesn’t fit with your style? Don’t compromise your class, instead upgrade your diamond ring in any of the FIVE ways for a stylish makeover for your bauble. Why Upgrade your Diamond Ring? Change is constant, meaning it is the only thing that keeps changing. We all change, every moment of every day. Our favorite movies change, fave songs change and food too. In fact, there is very little constant in each of us. People upgrade diamond rings for all sorts of reasons and if you find a reason that sounds lucrative to you, it is not wrong to upgrade your diamond engagement rings. Are you bored of the setting of your diamond ring? Don’t suffer it, instead get a new ring with a brand new setting. It’s a do-over that works great! Is your diamond looking dull? With time, inclusions can reduce the fire inside the rock. That’s reason enough to treat yourself with a new ring and change the diamond altogether. Did you get a fancy diamond ring as the engagement bauble? If you feel you’ve grown over it, there’s no harm in getting your diamond upgraded by cutting into a shape that you prefer! Perhaps your engagement ring budget was rigid at the time that you ended up with a basic ring. But, now you can get your diamond engagement ring upgraded with side stones, halos and melee diamonds as you wish! Did you get an heirloom diamond? While the antique allure can be stunning, it is common to upgrade vintage diamonds to make new jewelry such as an engagement ring. I don’t deny that it’s a challenge to upgrade your diamond ring. There are so many options and taking the risks of diamond scams yet again can be daunting if you’re new to trade-up of diamonds. Don’t worry, I will show you all the ways to upgrade your diamond ring like a pro. If you’re tired of a dull diamond on your center stone, get a new diamond that you like and exchange it with the old one. You will save loads and get a better shimmer on your fingers! What to remember when switching your center stone? It is best to check loose diamonds before upgrading your diamond ring. Ensure that the old switcharoo is not happening too. Hence, go with a trustworthy jewelry when you’re trading up your center diamonds! From halos to melee diamonds surrounding your keystone, there are many ways to upgrade your diamond ring. If you want a bit of color, add gemstones such as sapphire or ruby on your diamond ring. Before you upgrade your diamond ring, get the new stones you want to add in a drawing. Does it look good? Don’t proceed unless you’re sure. Every season, the trend of diamond ring changes. That’s why it is best to upgrade your diamond into a shape that fits you. Think long-term. Before you sign off on cutting your precious rock, consider all the options that prevent wasting the diamond during polishing. Similar shapes do not add to the loss of diamond when cutting. Have you got a plain metal band? Get it to mirror polished for a shimmer no new diamond can beat. Other options to change the texture are burnishing and matte finish too. 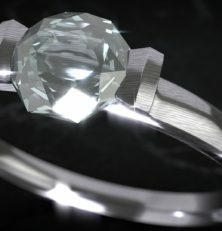 If mirror polish or hammered finish is not your cup of tea, you can even add diamonds on a plain band to transform it. It will add bling and look great, no doubts! Setting of a diamond into the ring with prongs or tension and so on is referred to as setting. The important thing is settings can be changed easily if you grow out of it. What to remember when going for a new setting? Don’t compromise, get the one that fits your diamond shape and style. The most challenging part of switching your center diamond or upgrading your diamond ring completely is the credibility of the jeweler you choose. Will, they scam you or steal your diamond? Will they replace your diamond with a CZ stone? If you’re doubtful, leave us a comment. I’d suggest you go with the best diamond geezer who also offers free lifetime upgrades such as the Blue Nile and James Allen. Who did you trade your diamond ring with? Tell me in the comments for getting a secret discount!